This weekend I got to guest post for one of my favorite blogs- Southern Lovely... Lindsay has bloggers over to share something on the topic of "What I know..." once a week. Let me preface this post with letting you all know that I am super new to sewing... totally a beginner in fact. I just started sewing in May of last year. Before I started, I had been following the Made blog for about a year and was so impressed by the things that Dana makes for her kids! I am not even sure how I found her blog or why I was following a sewing blog since I couldn't sew, but I couldn't help it. She is just amazing! For a year I told myself that there was no way in HECK that I could sew anything at all... let alone something I would let my kids wear out in public... After a year of telling myself that "I couldn't...", I went out on a limb and decided that maybe I COULD. I bought my sewing machine last May with the intent on trying to teach myself (with the help of the MADE blog) to make little skirts for my girls to wear to church. Before that, I hadn't touched a sewing machine since 7th grade (I made a rainbow windsock in home ec- ha ha). I was a little nervous, and I think my husband was too... Who knew if I was going to even like sewing- and here I was ordering a sewing machine... I hit the "buy" button before I got chicken so I didn't back out. When my sewing machine showed up, I left it in the box unopened for at least a week. I was so freaked out and didn't even know where to start. I finally got up the nerve to open the box and dig out the instruction manual. Umm... I don't know if that helped or made it worse, but I got the contraption set up and threaded and resolved to sew a skirt! It wasn't perfect, but it was a confidence booster that I could, in fact, sew! My reason for sharing this story is because it ties into what I know about sewing.... It's doable. Obviously- since people blog about it- but something that started off as a craft that was untouchable has turned into my favorite past time, favorite hobby, and has given me so much fulfillment since I started it. Give yourself a couple projects under your belt before you decide whether you like it or not... During my second project I almost gave up sewing all together and even still, there are times that I feel like I have no idea what I am doing, but I am so glad that I didn't give up! I honestly love sewing! Don't be afraid to ask questions! I love getting comments or emails asking about how I made something... and I know from experience that most bloggers are more than happy to help ya out when you need a little sewing advise! So remember how you taught me to sew and then I came home and totally botched the next thing I tried to make and I got so discouraged that I put my sewing machine up on a shelf and didn't touch it for months? Well I read that post you did and you inspired me (again) :) I made another skirt this weekend and it is far from perfect but it's wearable! For real, you rock. Loved reading this (again). Love ya Ash! good advice everywhere..thanks..I think it may apply to a lot more than sewing!! I love sewing, and the more I do the better I feel! Thank you for sharing! I'm new to sewing and most days I love it Sometimes though,when I sit on the floor surrounded by the mess I've made picking out my seams, I feel like I should just quit. It's good to know that I'm not the only one who has struggled with this hobby. It is also nice to know that even though I didn't grow up learning how to sew, I can still learn! The little skirt is adorable! Where did you find the pattern/instructions? I am new to sewing, straight lines and zig zag is about all I do, but I did make a dress with my sister (they were matching!) in June. 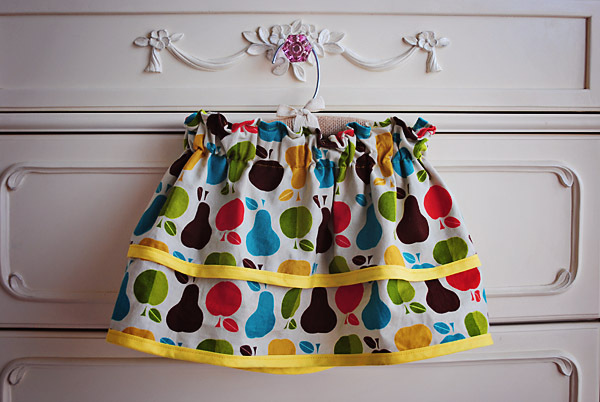 I would love to sew clothes more..this skirt is perfect for my granddaughters. Is this when you first started quilting as well? I LOVE your quilts! Wise words! Sewing is just wonderful, it's far and away my favourite thing to do.